This week I finished the binding on my Paper Piecing Monday baby quilt. 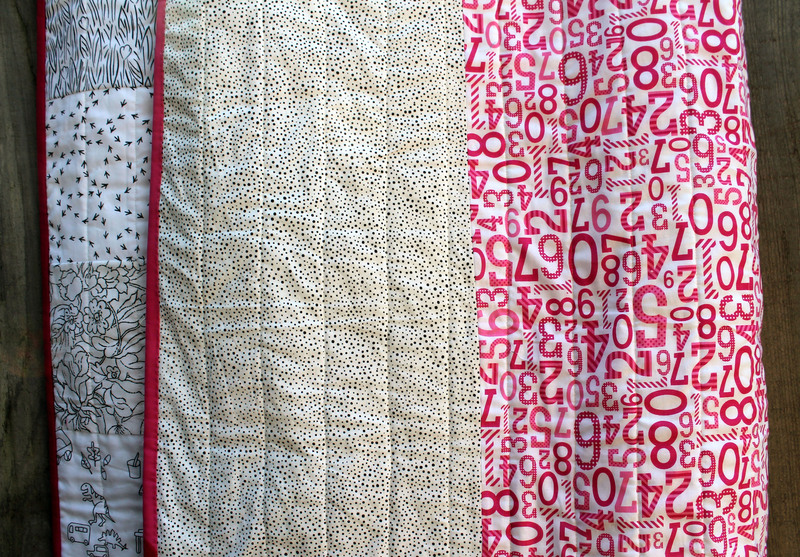 I am so thrilled with how this quilt turned out…and how easy it was to make. But you can find the free paper piecing pattern for all the blocks under the “Free Paper Piecing Patterns” tab if you want to make your own version. To build out the quilt I cut a bunch of 6 1/2 square blocks from my black and white stash. The blocks were just the perfect size so I could play with layout and see how I wanted the quilt to flow. I originally started with the pink blocks running down the side of the quilt, but after some procrastination went for the layout I have now – one row below the paper pieced blocks and 5 above. 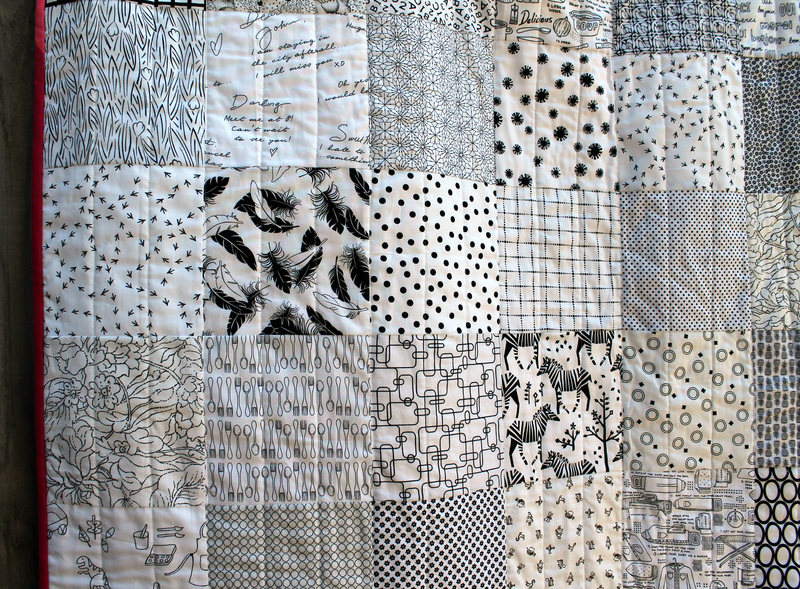 The quilt could easily have been made longer by adding another row or two of black and white blocks but I liked the square format. For the quilting I ran straight lines down the quilt and then sewed intersecting vertical lines thru the paper pieced squares. For the back I used some fun pink number fabric and some black and white dots. Nothing too fancy. The binding was of course scrappy pink solids! Technique: Paper piecing and simple patchwork. 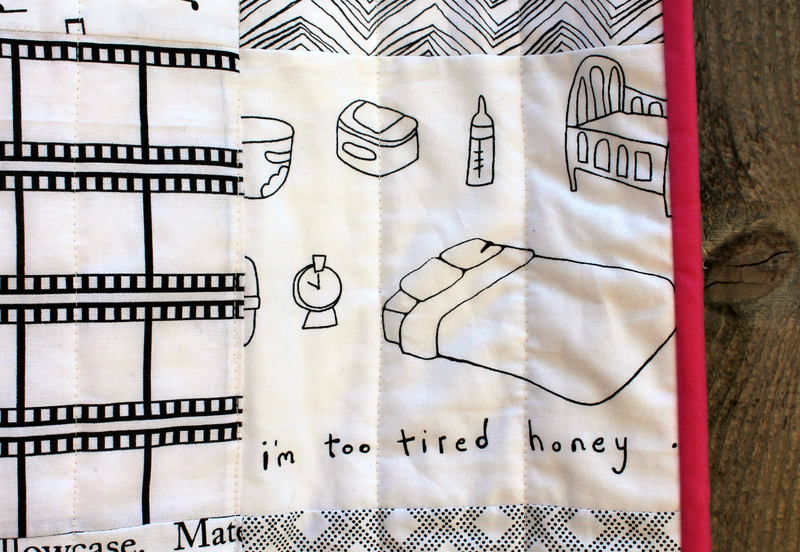 Oh I love this quilt ~ you are so clever! I’m inspired! background for the paper pieced stars…love it. This quilt is fantastic! It’s simple (not saying easy) and sophisticated. What a wonderful idea. Oh my goodness this quilt is stunning. This is my problem – I don’t think about only doing a few complex blocks and placing them in a field of more simple blocks. I feel like I have to make the whole quilt difficult. Your placement of complex with simple, neutral with color just takes this over the top for me. Brilliant. 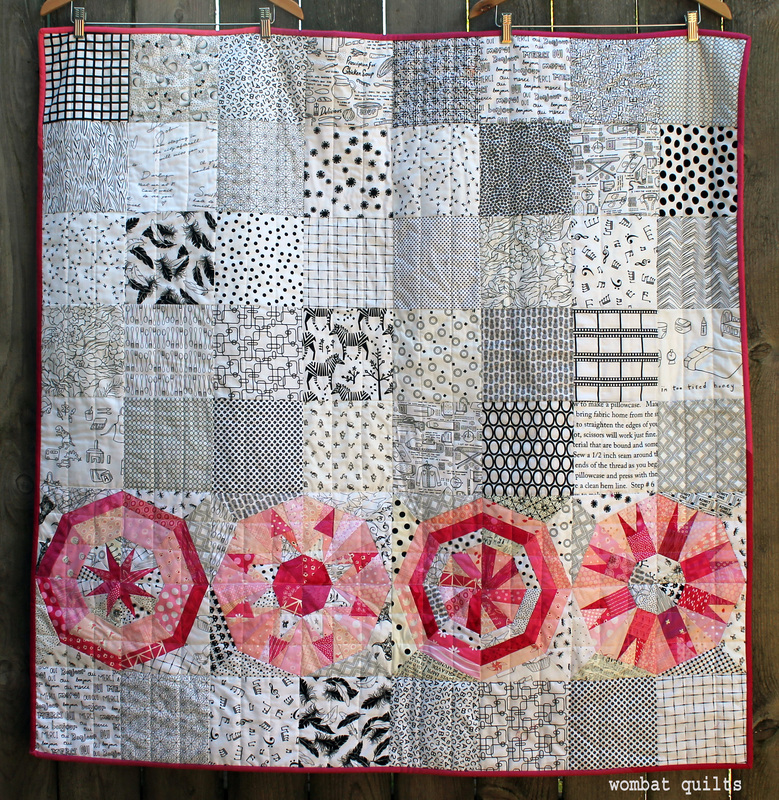 What a beautiful quilt; the fussy cut square seems absolutely perfect to me! What a wonderful creation you and your imagination + extraordinary stash have wrought!! Very, very fortunate friends about to embark on a wild and wonderful ride and they are fortunate to have you as a friend. Hi Cath! Colleen just shared your post on my blog and I am so glad that she did. I want to tell you how much I love your quilt. It is absolutely brilliant! Your friends will adore it too and I can see that this would also be great for a child, a teen and an adult. It will definitely grow with the baby and be treasured always. Beautiful, quirky, original, clever – it should fit your friends’ baby to a T! What a wonderful stash you have, and how well you use it! The paper pieced blocks are enhanced by the simplicity of the rest of the design. A truly lovely quilt. 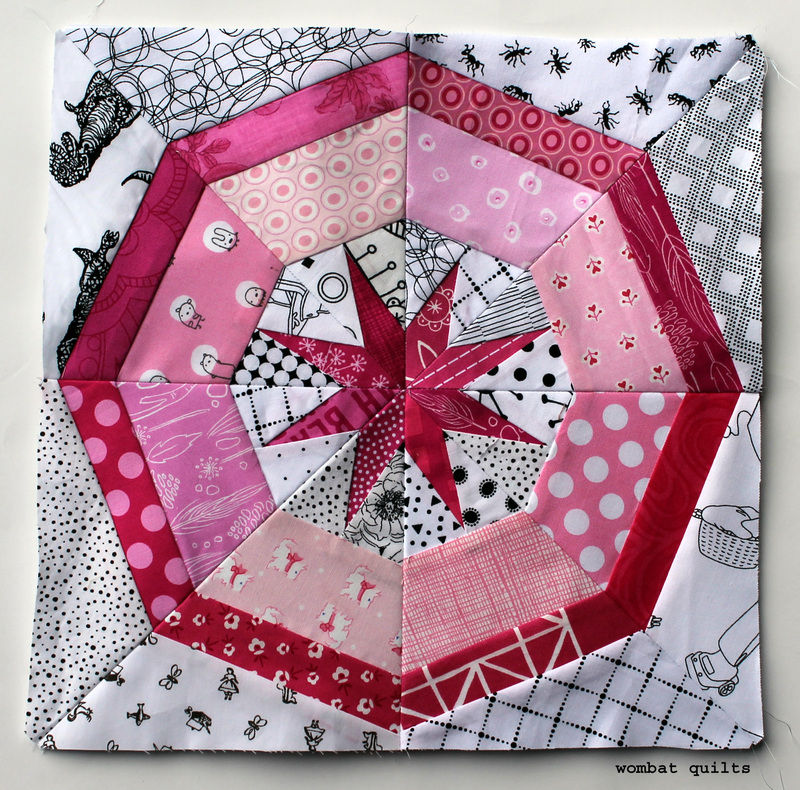 Your baby quilt is fabulous and so much fun!! Thank you for sharing the paper piecing pattern. I have the need for several baby quilts and this one might possibly be one of them. Wonderful!! Oh yay! I love this quilt I’m so happy that we have a new baby joining the family! Hope she is having a girl, cause I so love the pinks with the black and whites! 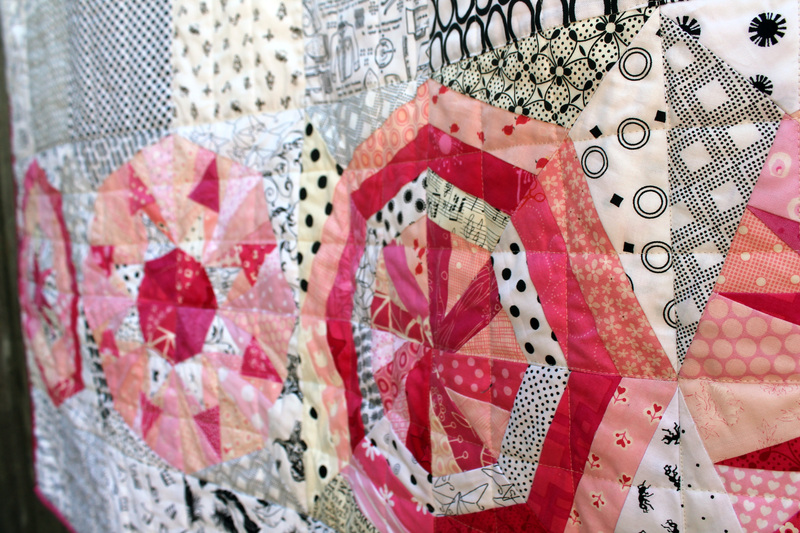 I love the extraordinary placement of the pink paperpieced blocks amond the simple black/white blocks. It is so striking placed in this way and the pink blocks gets all the attention, as they should!!! I admire your imagination. This is a great quilt! Good work! Looks good……I can see lots of possible choices for colored blocks……boy or girl. 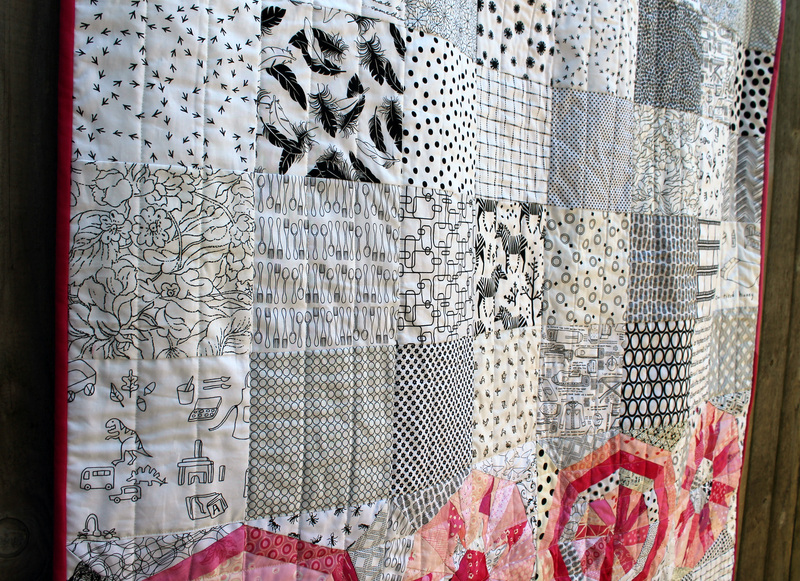 I must say…….This is a really cool quilt! Barbara it was a scrap I had with no selvage information. Sorry. When I opened the email and saw your fantastic quilt I was just blown away! 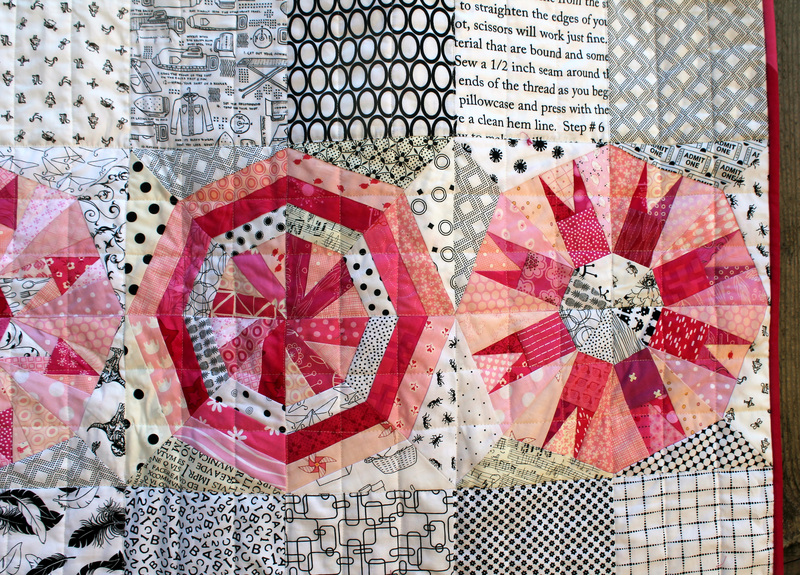 I love the idea of how you incorporated the paper pieced blocks and made them the feature! Has spurred me on to try this……today!!! That turned out amazing! The grey blocks with the colorful detailed row is just stunning. So clever. This is lovely! I love the contrast between the very detailed piecing and the bigger block piecing! Such a sweet quilt! I love your layout and the big squares of LV. Your quilt is beautiful, such a sophisticated baby quilt! I love it! The pops of pink against the black and white prints are great! Wow, you did it again!! This is amazingly beautiful! How you have made a feature of four blocks is just perfect. though I am quite late – I just have to say I always admire your fussy cutting!